Lively illustrations and amusing word play make this board book an ideal read-aloud (1-3). When five little monkeys eat some ice cream and play in the mud, they become icky, sticky monkeys . . . and Mama says it’s time for a bath! But even after those silly little monkeys scrub themselves clean, they find a way to get mucky all over again. Toddlers will giggle over the wild monkey antics, rhyming refrains, and expressive, up-close monkey art in this brand-new board book. Eileen Christelow was born in Washington, D.C. and grew up in a family of avid readers. It was in high school that she first made the leap from reader to writer, publishing her first stories in her high school’s magazine. After studying art history and drawing in college, she discovered a love of photography and began building a career as a photographer. Her interest in children’s books was always strong, and after the birth of her daughter, she began thinking about writing one of her own. Her first book, Henry and the Red Stripes, was published in 1981. 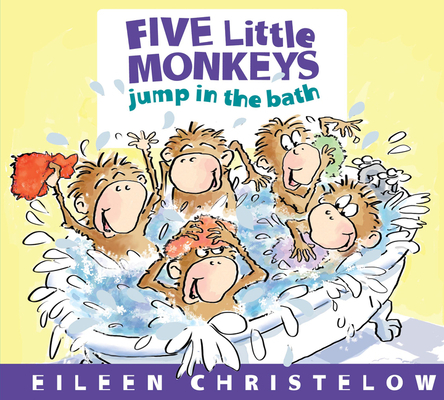 Since then, she has written and illustrated numerous best-selling picture books including ten popular books about the Five Little Monkeys, Letters from a Desperate Dog, and Vote! She lives with her husband in Dummerston, Vermont, and you can learn more about her life and work on her website, www.christelow.com and on www.fivelittlemonkeys.com.